Site preparation work has been underway since last week for the new Dollar General store to be located on south Highway 39-14 in Albion. 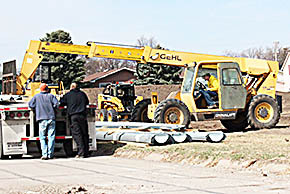 Bygland Dirt Contracting was grading the site last week. Some of the construction materials were being unloaded Monday (photo above). The location is bordered by Columbia Street, A Street and Walnut Street.